We’ve only been here about 7 months, but we’ve figured out some of the migratory patterns of birds through the Riverina. This may not be 100% accurate (or even 10%! ), but here are our observations on birds that have visited our neighbourhood and moved on. We’re not sure if they come and go looking for warmer or colder weather! But, as the seasons change, so do the birds. This is an immature crimson rosella. Pretty spectacular, eh! Parrots: We’ve mentioned parrots a lot on this blog. We like to brag that we live among them! And the cool thing is that there have been so many different ones. Most of them move pretty quickly, so precise identification is a challenge for us, as sometimes the difference is very minimal (such as how much blue is on their wings). But after a few days we started to notice characteristics more accurately. When we got here in July, there were a lot of Red-rumped Parrots. These were here for a long time, but are a bit less common right now. Then came Blue-winged Parrots. We first saw them in Corowa in November, and they’ve been in Wagga for a few weeks – there were some passing through our back yard one night this week as we ate dinner. We are afraid that soon they will be going for cooler climate in the mountains, but it has been a cooler-than-normal summer here, so for now they are still hanging around. 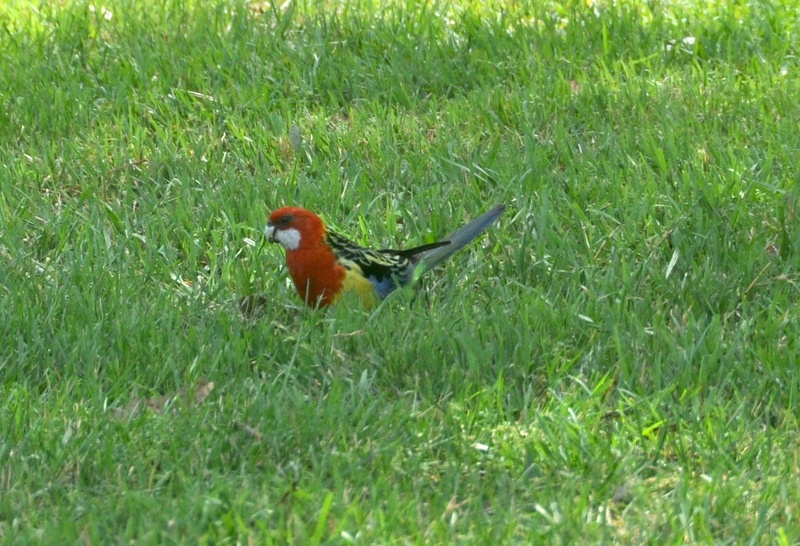 During late December and through January, there were a lot of Rosellas around, both Eastern and Crimson. These are the spectacular ones. They are the kind of bird that you would want to have in a cage in your house…though that wouldn’t be nearly as amazing as living among them and seeing them as you are out cycling or are walking from your car to your office in the morning. Just before Lisa headed back to a North American winter, we were out cycling early morning. A whole lot of beautiful Eastern Rosellas flew past us at one point and she blurted out “I don’t want to go to the cold place where there aren’t parrots.” Crimson rosellas are quite amazing, but Easterns are stunning. Damp and snowy Ontario and Quebec, or Eastern Rosellas...? Which would you choose? Of all the birds we live with, these might be the best. We’ve also been lucky enough to see the occasional Turquoise parrots over by the coast. At first, we thought they were just bluewings (just blue wings…we’ve become so complacent…) but then realized that they also had blue faces. Unfortunately, we just get a quick glimpse of many of these birds, so no time to get photos. And now we will stop bragging about parrots and talk about some less spectacular birds. Honeyeater: This is a kind of bird we didn’t even know existed. But for a few weeks, there was one hanging out in our back yard. It took awhile to identify him; at first, we thought it might just be a myna that had been playing Rugby League and got a bit of a shiner. 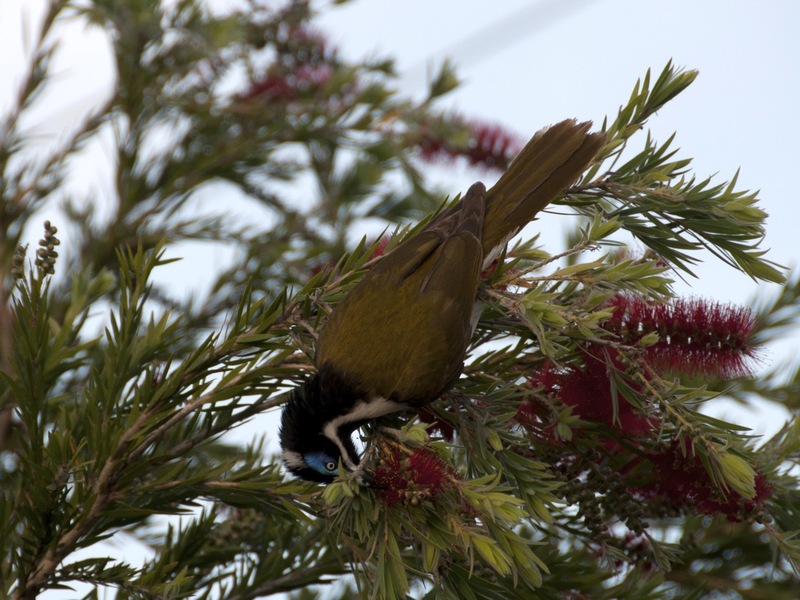 But no, it turns out that it was a blue-faced honeyeater. Sure, he isn't a parrot, but this blue-faced honeyeater is still quite pretty. 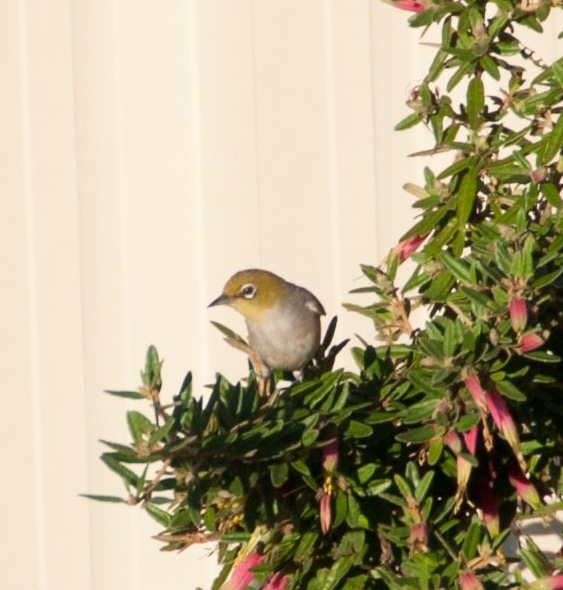 He lived in our back yard (feeding on this bottlebrush) for a few weeks. 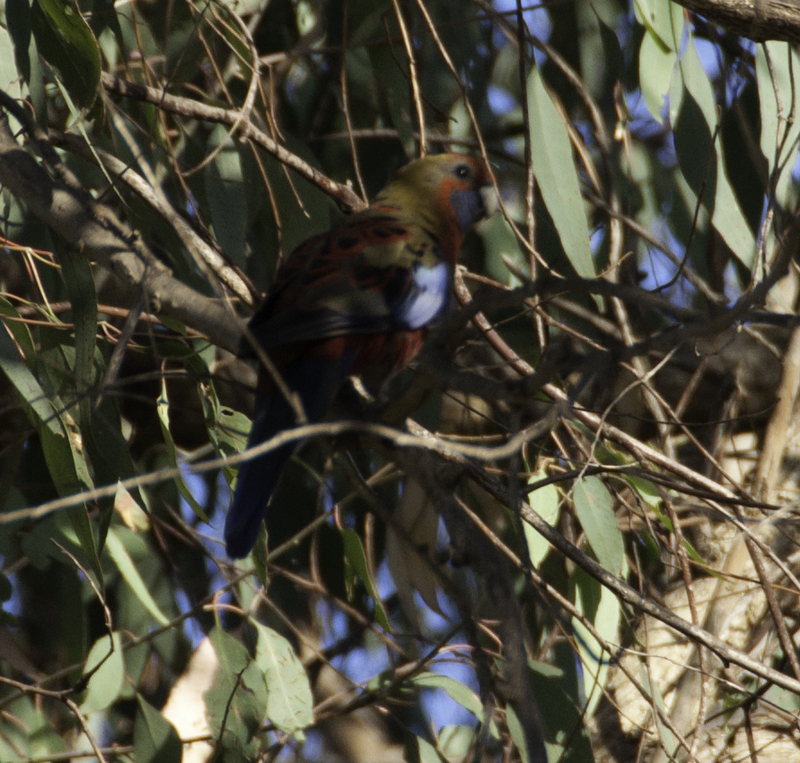 It was was one of those moments where we both thought “Wow!”, not because it is a really beautiful bird (sorry honeyeater, you ain’t a rosella) but because it might actually be the first time we saw a bird here that we had never heard of before. Yes, we see lots and lots of parrots (sorry, we said we would stop bragging) and cockatoos, and while those are unusual, we at least knew about them. Recently, campus has been inundated with Red Wattlebirds, which are another kind of honeyeater. On first glimpse, they could be a blue-faced honeyeater, or even a myna but we’re pretty sure they are wattlebirds (we’ve been told this is something that shows up this time of year…). We saw another honeyeater at the coast, who was very different, so it will be described in an upcoming post). 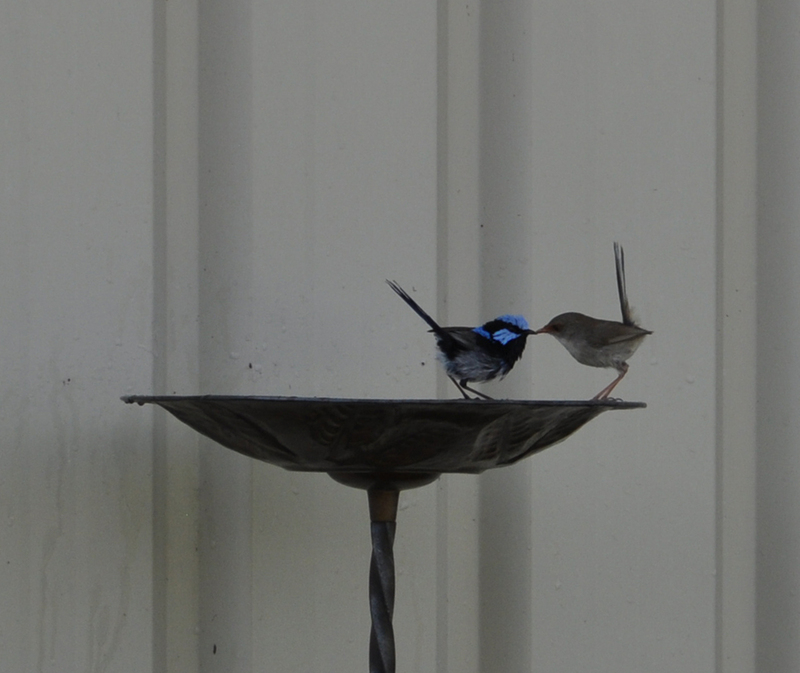 Superb Fairy Wrens: Yes, that’s their real name! We also think they are superb… but kinda cool that somebody just went and named them that. The males are the blue ones, and the babies and females are brown. We had a pair nesting in our back yard this spring, and they would come out to play in the birdbath and feed every evening as we had dinner. Then, as summer came, the babies appeared too. Unfortunately, they seemed to have moved on. Darters: big water birds that we’ve seen here and there. First one was in Melbourne in September, then we didn’t see any for quite a while. Dan spotted one in Canberra in late November, and since then they’ve been pretty common around the lakes and dams around Wagga. We assume they will go away again. For a while, we weren’t sure what they were, thinking maybe they were cormorants (which we also see occasionally) but have pretty much got it figured out now by how it holds its head while flying. The really cool thing about darters is that you can sometimes see them sleeping with their wings out…it looks odd and hopefully they don’t do it on a windy day or they might end up getting blown away. Darwin would probably say that these birds evolved to scoop yabbies out of dams. 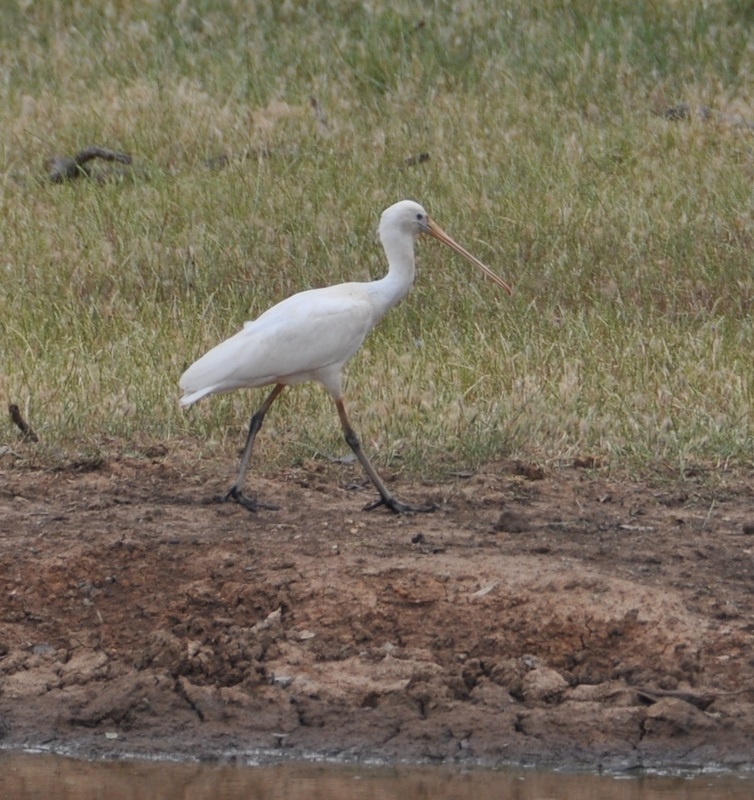 Spoonbill: Another large water bird that has shown up for the summer. And again, first spotted near Corowa; even though it is only about 100 miles away, it is a lot hotter down there so migratory birds show up there first on their way north. The name spoonbill is quite descriptive – basically, they look like a short-necked egret that someone grabbed the end of its beak, pinched it so it became spoon-like, then stretched it. Laughing Kookaburra: Yes, it’s the ubiquitous bird that everyone associates with…somewhere. We didn’t actually realize it was Australian. Not sure where we thought it was from. Sing along now kids…”Kookaburra sits in the old gum tree…“. We often see these around town or out on the highways, sitting on hydro wires. Cohen would love these little guys: is there some sort of mash-up that can be done “like a kookaburra, on the old hydro wire…”? Probably not. Unfortunately, because they live on wires, they are really hard to photograph. Dan’s never heard one laugh; they just sit silently on the wire for him. Lisa has heard them laughing… probably at Dan, since he looks pretty goofy in his bogan (surfboard) shorts in the backyard (sorry – no photo; it’s embarrassing enough to see Dan walk around the house this way, let alone have a pic for posterity). Does the silver ring around their eye work like that black goop NFL players smear under their eyes, deflecting light to they can see bugs better? And yes, we said we would stop bragging about parrots, but the pics below are the yellow version of crimson rosellas, which only live along the NSW/Vic border. 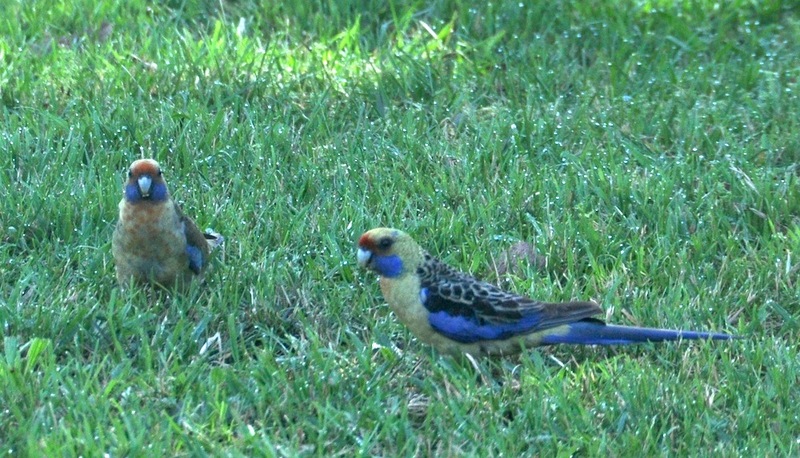 These ones were on the lawn as we had breakfast at our friends’ house near Corowa…so no more bragging but, for most of you reading this, we live among parrots and you don’t. Hah. 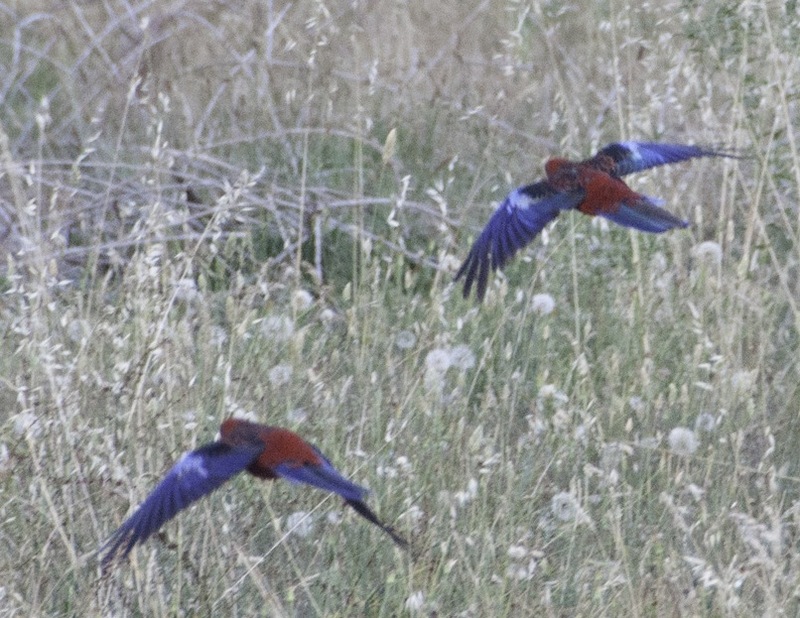 This entry was posted in birds, parrots, rosellas, wildlife and tagged australia, birds, wagga. Bookmark the permalink. We have the snow that so many Aussie’s flock here for but we’re more than happy to escape it. Perhaps next year around this time we can see all these lovely sights in person.